We’ve already covered some of the restaurants SurveyLA identified before—like The Black Cat in Silver Lake and Idle Hour in North Hollywood. So here, we shine the spotlight on just a few other old, iconic eateries, offering a very, very small sampling of other historic restaurants identified by SurveyLA. Los Angeles architecture firm Armet and Davis designed the Googie-style Pann’s Coffee Shop for the Panagopoulos family in 1958. Featuring a sweeping roofline, stone walls, terrazzo floors, red leather booths, and an animated neon sign, Pann’s has stayed in the same family throughout its history. It’s open for breakfast and lunch seven days a week. 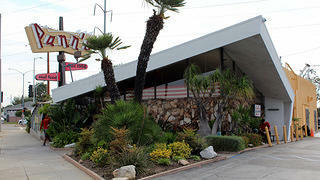 Armet and Davis also designed the 1953 building that would house Kerry’s Coffee Shop in Sherman Oaks for many years. 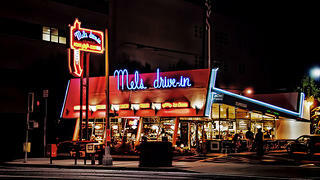 Now home to a Mel’s Drive-In restaurant, the building is one of the few remaining Googie-style coffee shops in the San Fernando Valley. 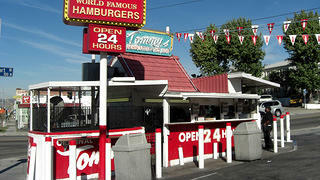 The walk-up hamburger stand on the corner of Beverly and Rampart boulevards was the first of the Original Tommy’s Hamburgers restaurants, which now has more than 30 locations across Southern California. Opened by Tom Koulax in 1946, the small stand served hamburgers and hot dogs topped with beef chili; today the menu includes items like tamales and breakfast burritos. 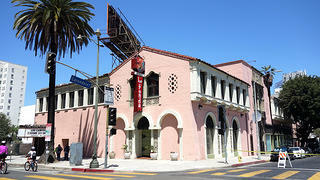 When La Fonda opened in 1969 on Wilshire Boulevard near Los Angeles’ MacArthur Park, it was the first mariachi dinner-theater restaurant in the country, if not the world. It was a popular nightspot and home of musical group Mariachi Los Camperos until closing in 2007. It reopened in 2016 in the same building, with the same mission to provide patrons with authentic Mexican food and live mariachi music. 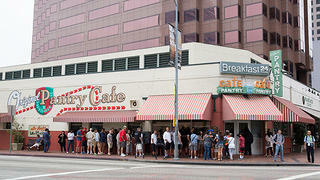 A classic 24-hour coffee shop and restaurant, the Original Pantry Cafe in downtown Los Angeles opened in 1924 and moved to its current location in 1950. Lines regularly wrap around the outside of the building as customers wait for a table to eat breakfast (served all day) or a roast beef dinner. Built circa 1913, the building that now houses Walker’s Cafe in San Pedro was originally used as a trolley station for Los Angeles’ Pacific Electric Red Car line. 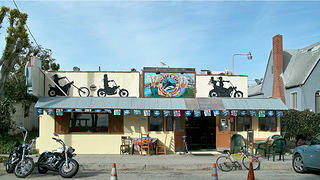 A local couple opened the restaurant, located near the ocean, in the 1940s; today it’s a popular place for motorcyclists and anyone craving a classic cheeseburger. Two brothers built this mansion in the Hollywood hills in 1914 to house their collection of Asian artifacts. Decades later, a new owner opened a cocktail lounge in a back room. 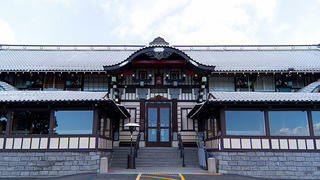 Food and drink offerings in the space expanded over time, and the restaurant Yamashiro opened in the 1960s. 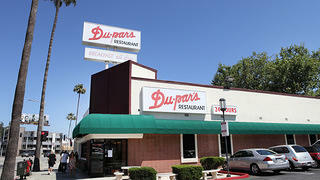 The first branch of Du-par’s Restaurant opened in the Original Farmers Market in Los Angeles’ Fairfax district in 1938. The second branch (pictured here), located in Studio City, opened in 1948. Now with four locations, the 24-hour restaurant chain continues to be famous for its buttermilk hotcakes. 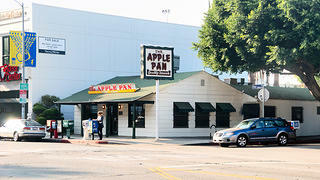 Ellen and Alan Baker opened their restaurant, The Apple Pan, in a small house on Pico Boulevard on April 11, 1947. 70 years later, people still flock to this West Los Angeles diner to eat hamburgers and apple pie while perched on red leather stools around the U-shaped counter.